Dresses can run 1 to 2 sizes smaller then store bought clothes so measure carefully. If you are broad shouldered or athletic, work out or have trouble with sleeves being too tight please go up 1 or 2 sizes. If you are a perfect match to the chart you may want to go up a size or it will fit snugly like a glove. The customer is responsible for choosing the correct size. We can assist if needed. The dress is the size of the chart dimensions on the dress page. If your measurements are disproportionate compared to the chart the dress may need extensive alterations to make it fit and it may not be a suitable choice for you. Full looking dresses may not have full underlining so will not be larger even though it appears that way. Empire cut is just below bust and you would use natural waist area for measurements. Bridesmaids and Prom dresses are not returnable, so choose carefully. Please read this page and do exactly as it says so you don't have this problem . Its better to order too large then too small. How to choose a size : In order to assure the right dress size is chosen we need you to measure your body at the bust, waist, and hips. See diagram below Tell us your height as well. Long dresses are a standard 59 inches hollow to hem approx. Short dresses are 42 to 45 inches and tea length is longer. Most gown returns are for larger sizes because of inaccurate measuring. It's better to err on the large side to be safe and then have the dress altered to fit. If you are disproportioned and or plus sized or if your bust and waist are the same measurement or very close the dress may not work for you as its made to the chart . We have to accommodate the waist and then the top would be huge requiring major alterations or remake. Your own body measurements need to be on the order form when ordering, not the chart measurements. 1. The Bust should be measured around the fullest part from the front to the back across the bra ( OVER THE BRA) not under the bra or on the rib cage ! Your bra size is not the same as your bust measurements. 36C is not the same as your bust measurement. 2. The Natural Waist needs to be measured about 2 inches above your navel , maybe more . (Its higher then you think.) Or the smallest part of the midriff. If you are not sure where to measure, bend to your side and put your fingers where the bend is and that should be your natural waist. Measure there. Do not hold your stomach in as this will make a skin tight fit. Do not measure where your pants are worn as this will throw the size off. Put the tape around the waist area smoothly right on the skin and do not give any slack or have a finger in between tape and body. It's best to have someone else and preferably a professional seamstress do this for you. It's probably the most important measurement and needs to be 100% accurate to obtain the correct size. Not everyone will fit the chart perfectly so we need these numbers to get as close as possible to the size needed. 3. The Hips are around the fullest part of your buttocks area about 8 inches or so below the waist. For plus sizes measure around the fullest part of the stomach also and give us 2 measurements. Only in the case of a straight skirt, slim-a-line or when the hip is several sizes larger than the other measurements will a hip measurement be necessary to determine size. It’s mainly used as a reference guide to the size but we do need it. Measure as close to the skin as possible as clothing creates some bulk and can add to the size. See picture below for correct areas to measure. Our gowns are all cut to size chart measurements and not your body measurements, because of this most all gowns to need to be altered when they arrive. Normal alterations are lifting the shoulders, taking in the waistline, or adjusting the hemline. Alterations are needed on 98% of all . Do not expect an exact fit when they arrive. They may have up to a 5/8" finished seam on the allowances- but may be clipped in curved areas. There may also be seam allowance at the zipper line if you need extra room through the back. If it fits big on the shoulders- The shoulder seam may be above your shoulders up to 3", this is a normal adjustment and a seamstress can take the shoulders down to rest on your shoulders naturally. 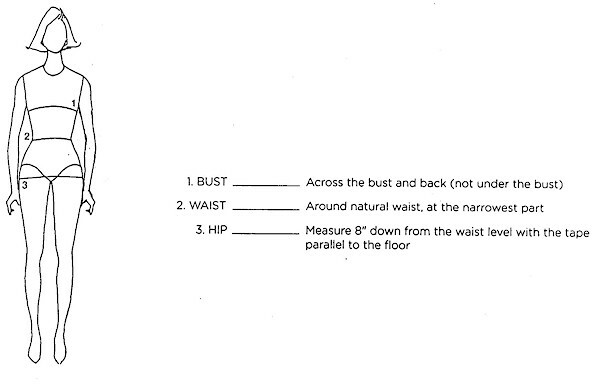 The waist can be adjusted in or out according to the fit you desire. We suggest finding a well experienced top notch Seamstress in your area to alter the gowns. Look at her work and get references. Many areas also have Dry Cleaners who have alteration specialists that can do the job. Bridal stores are another option but may only alter their own gowns.